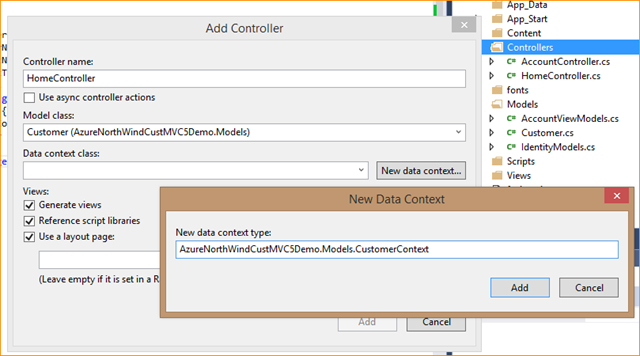 This post is about using Model View Controller (MVC) 5 in Visual Studio 2013 with Entity Framework 6 to do CRUD operations on a SQL Azure Database. 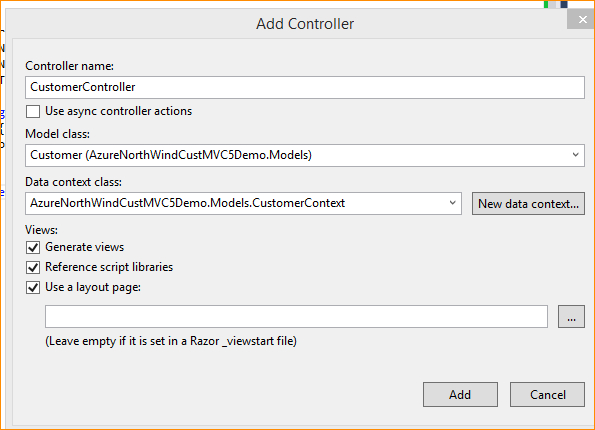 It is definitely NOT Rocket Science but there are a few GOTCHAS to look out for and definitely a new way of doing business with MVC 5 as it relates to Controllers and Scaffolding with Entity Framework. 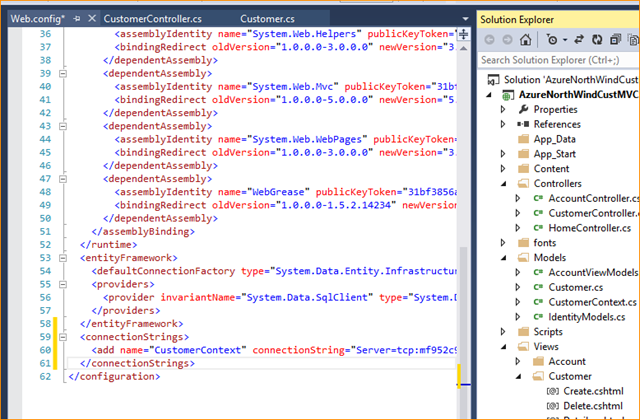 My code will be up at Code.MSDN.com and I will put it in Git Hub as well. I will update the post with the links when i upload them. The first thing you have to do is create your project. 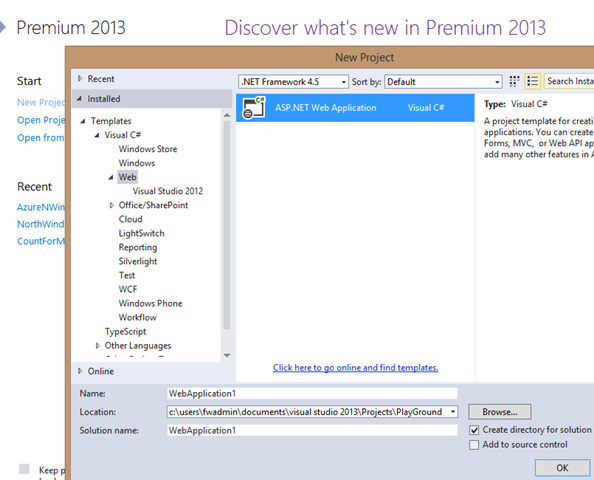 So, Launch VS 2013 as Administrator and under the Installed Templates click Web and select the “ASP.NET Web Application”, provide a meaningful name and click OK. The next thing we will do is select MVC since that is what we are doing here today. As this is DEMOware we will not be doing any Unit Testing as well so unselect that if it is selected for you. Once complete your project will look as mine does below. 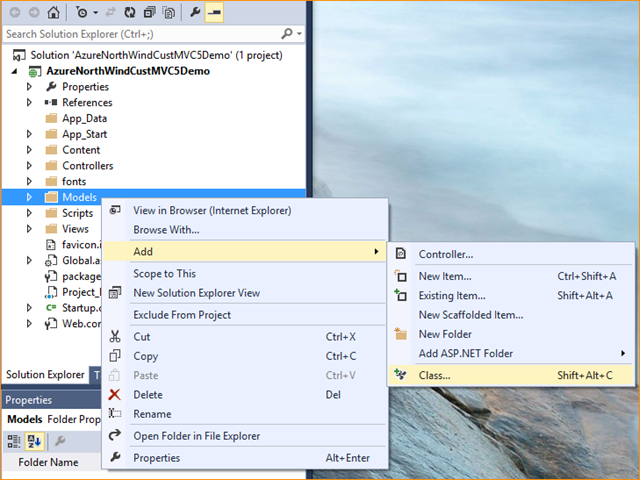 and a project ReadMe that invites you to customize the Applications etc. will be there for you as well. 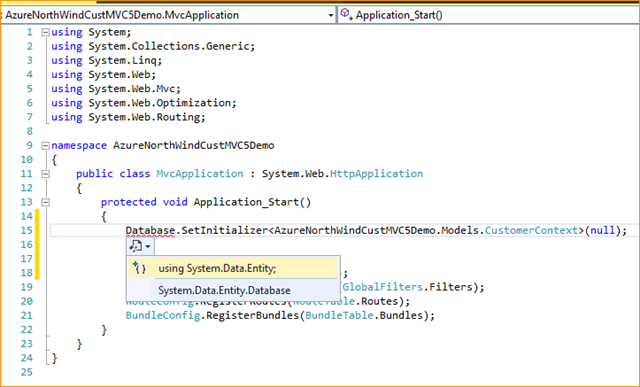 Above is the Silverlight App that ships with SQL Azure Management and you can see some of the fields we will Model. To Model the entity, you add a new Class to your Project as i have below. Right click on the Model Folder and..
With that, you have your Model. This is a good time to Build your project so the Model will be available for the Controller which we will do next. 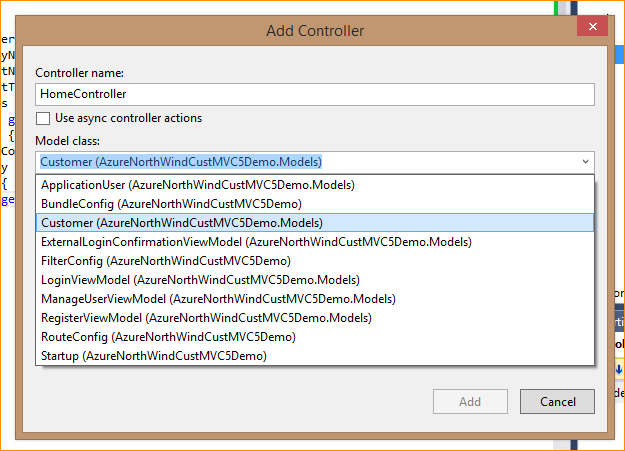 You have the option to do this manually by doing and Empty Controller but since this example is about Entity Framework 6, we will use a controller that will create all views with EF6. One minor change that I did. You will notice above my Controller Name “WAS” Home… but I realized that there was one already created called Home so i changed it to Customer as you can see below. 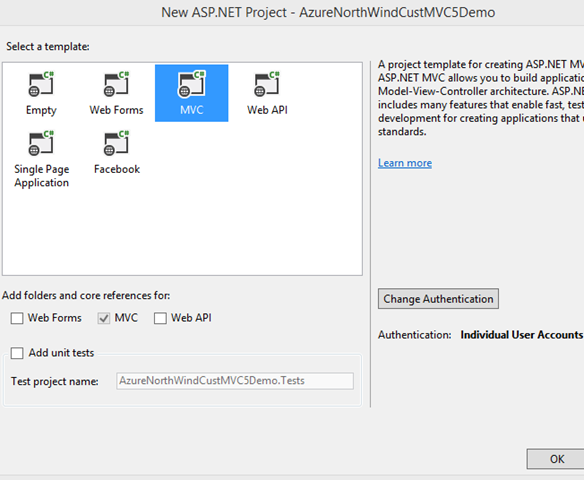 Now you may think your work is done but there are at least Two (2) more things needed to make this connect to your Azure Database. 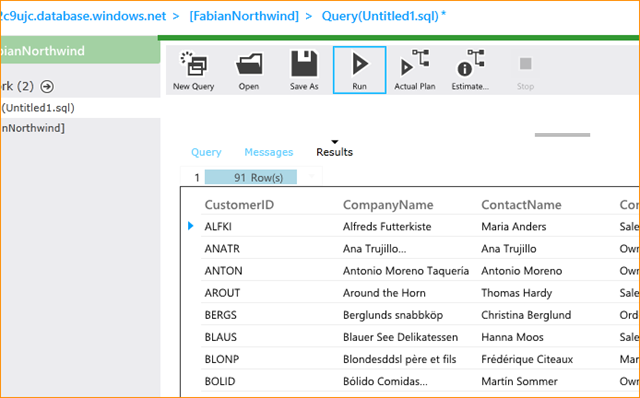 The first thing is to (1) Modify or ADD the connection string to your SQL Azure Database to the Web.Config in the root of your Project. 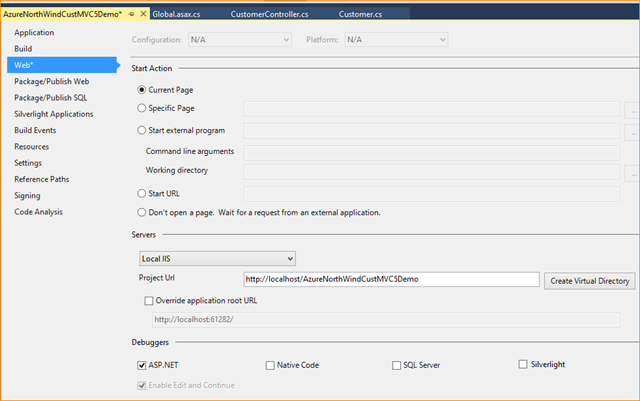 If you dont MVC will create a NEW database for you locally in SQL Express more than likely if the Controller DOES NOT find a Connection String of its Name inside the Web.Config. That is why you will see below that the Name of MY connections string is the same name of my Context Class. Below is a code snippet of the connection string minus my credentials. 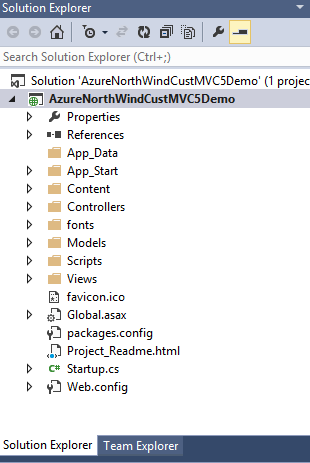 The second thing (number 2) is to Add a command to the Global.asax file which is fired upon App Launch to Initialize the Database connection I want in Azure, you will need to have a reference to the System.Data.Entity namespace as i have shown below when you do this. You will notice it is also bound to the Model Context Class. Just a little weird thing that I noticed. 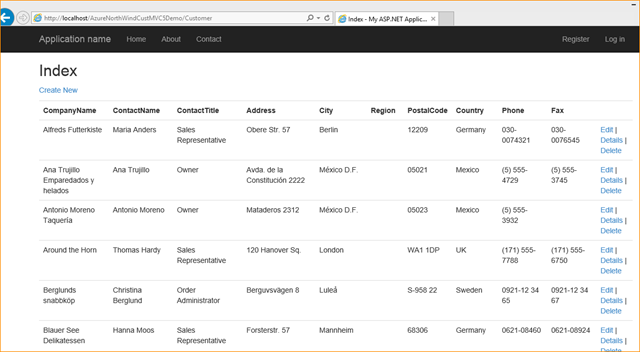 I did this on my Windows 8.1 box and when I tried to launch the browser to test my work, IIS Express failed with some Process number, so i changed my Build to point to my Local IIS and created a Virtual Directory as you see below. 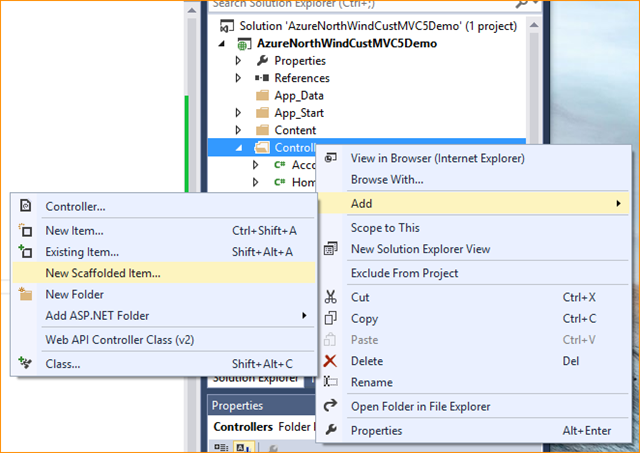 This is really cool, i know I usually talk about SharePoint but this is equally important and you will also see a new MVC Template in SharePoint for Visual Studio 2013 in Cloud Apps, make sure you give that a try. Chaks has a good post out on it here. Good work needs to be pointed out Chaks, cant wait to share the stage with you again mate. Perhaps #SPC14 ? Ill check out the post, thanks for the info.